and not without its suffering. they simply came to nothing. That line of inquiry closed. 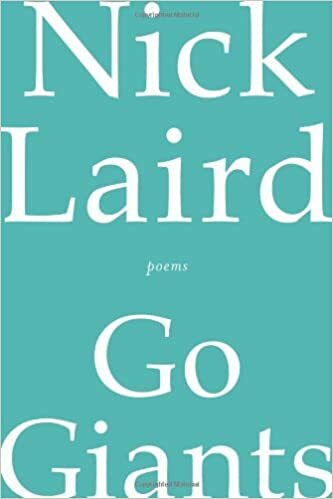 I approached Nick Laird’s Go Giants knowing next to nothing about either the collection or the poet. The titular poem had been read to me once before, and somewhere in the recesses of my mind I was aware that Mr. Laird was married to the writer Zadie Smith, but beyond that this book was entirely new to me. This turned out to be a blessing in disguise; I was entirely unprepared for the ways in which Go Giants took the title (and titular poem) remarkably seriously, exploring myriad ways in which ‘giants’ both literal and metaphorical impact our lives and our personhood. Before I explore the rest of the collection, however, a word on the titular poem itself. When the poem was first read to me, I laughed, I smirked, I enjoyed myself. While I was not entirely sure of the ‘point’ of the poem, I could not escape the notion that a) that was the point of the poem, and b) who cares? it’s ridiculous and silly and serious and fun all at the same time, it does not require any further point! Yet, the second time I encountered “Go Giants” (on my first actual reading of the piece), I confess I was somewhat discouraged. It was certainly skilled, both in terms of the ordering of the list and in terms of enjambment –– not to mention the rather brilliant cutoff line in the final stanza: “Go in peace to love and serve the. / Go and get help. Go directly to jail.” –– but my previous concern of meaninglessness overpowered the sense that meaninglessness might be the point of the poem. Further, it did not seem to me like the poem was actually making that point; even if it was, it did not seem to make it as well as it did when it had been read to me. What was I missing? I did not have a good answer, and the next several poems in the collection revealed little of the answer to me. Lines in “The Mark” and “Pershing” seemed to come close, but no matter how hard I tried, I found myself unable to get on board. Then I came to “The Effects.” The image of the gods fading out, not being replaced so much as simply coming to nothing, shook me deeply; what moved me even more was the closing lines, “… the mongrel running / masterless among them.” The idea represented here, of the masterless dog disturbing a somber, funereal setting, and (most importantly) this disturbance being a good thing (“…how the faces turn / one-by-one and radiant”), is phenomenally done in its own right, but it mattered to me so much more because of its connections to the poem “Go Giants” and the collection Go Giants. After I finished “The Effects,” my perception of the collection changed. Where once I saw a somewhat unclear nihilism, I began to see a series of remarkably astute observations on the cultural understandings of nihilism. The speaker in this collection ceased suggesting that meaninglessness is the point; instead, the speaker began to point out the ways in which we can create the meaning that isn’t otherwise there. To be sure, meaninglessness – or at least silliness – plays an enormous role both in life and in Go Giants: “History of the Sonnet” stands out as an easy example, and indeed the entire collection is resplendent with an overall feeling of goofiness and an utter refusal to take things too seriously. Yet there is a feeling one gets upon finishing the collection that we make the meaning we want by working together. Readers need writers; writers need readers; people need each other. In the section of “Progress” titled “Valley of Humiliation,” the speaker notes that “… the problem with leaving home / is home follows,” and the speaker is indeed right to point this out. What the speaker does not need to say is that regardless of the problems such adventures bring, they are entirely necessary. We can choose whether or not a “mongrel running / masterless” is going to upset us or turn our faces radiant; likewise, we can choose whether or not we are going to “Go into detail. Go for the throat.” And Go Giants encourages us to accept the gods’ withdrawal from our lives, move on, and go big or go home.